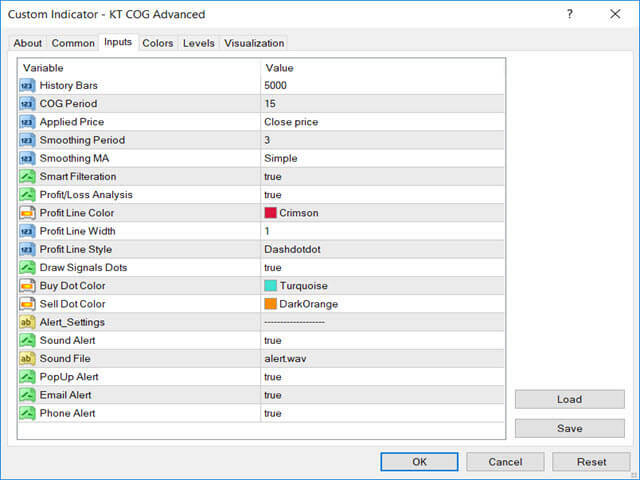 KT COG is an advanced implementation of the center of gravity indicator presented by John F. Ehlers in the May 2002 edition of Technical Analysis of Stocks & Commodities magazine. 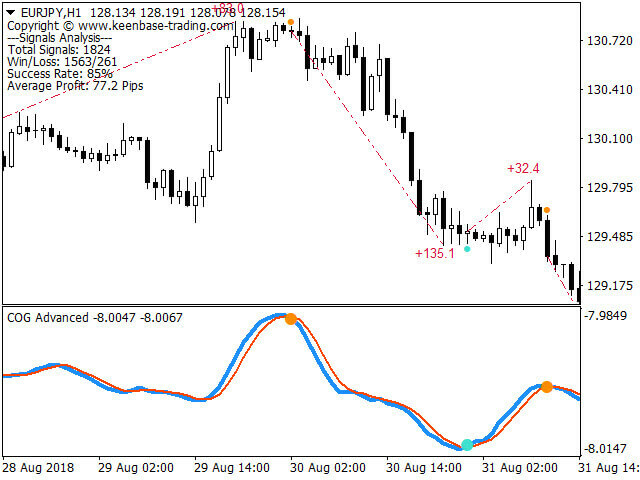 It's a leading indicator which can be used to identify the potential reversal points with the minimum lag. The COG oscillator catches the price swings quite effectively. Signal Line: A moving average plotted on the COG line. A buy signal is generated when the COG line crosses above the signal line and a sell signal is generated when the COG line crosses below the signal line. Please note that the COG is a leading indicator. For profitable trading, each crossover cannot be used as the buy/sell signal. 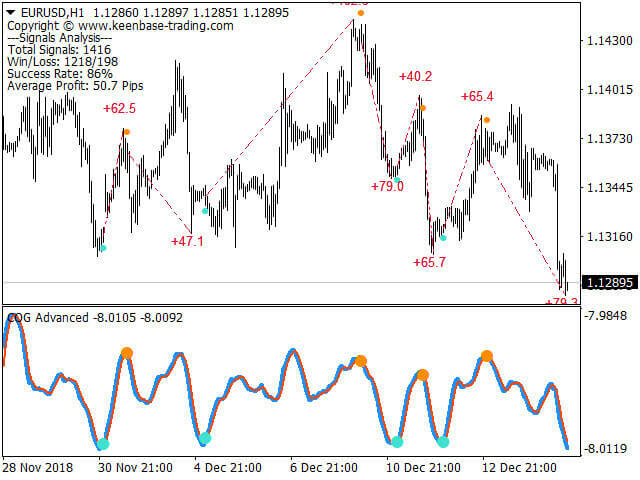 There is a need for adaptive filtration before this oscillator can be used for practical trading. Our adaptive filtration algorithm combines the original COG formula with the major trend direction and market acceleration/deceleration. 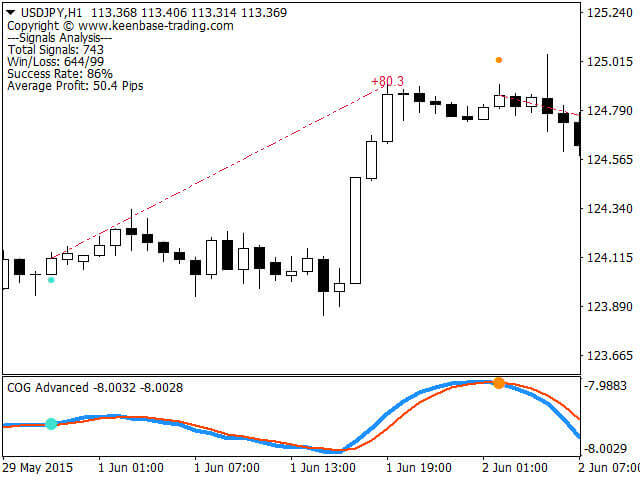 The end result of such combination is that we get a smooth leading indicator in which the crossover can be used as the buy/sell signals. 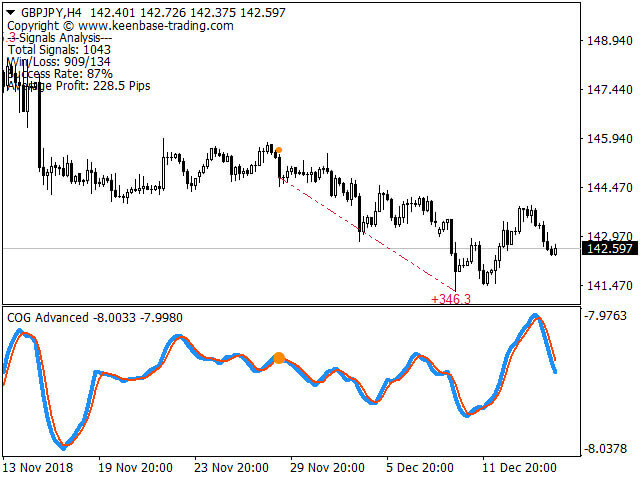 Very good for the scalping on smaller time frames such as M1, M5 etc. Catches reversal points earlier with the minimum lag. Buy/Sell dots at each crossover for signal generation. Performance analysis metrics such as Win/Loss, Success rate, Avg. Profit etc. COG Period: The period used for the calculation of main COG line. Smoothing Period: The period used for the calculation of signal line. Smart Filtration: Set the smart filtration true or false for the crossover signals. Performance Analysis: Set the performance analysis true or false. Draw Signal Dots: You can turn on/off the dots drawn at each crossover. Don't worry, even if you choose to not draw the signal dots, you'll still receive the alert for each crossover.